One of the things Seattle's teachers won in their recent strike was a commitment from the school district that elementary school students would receive a minimum of 30 minutes of recess per day. In fairness, some schools were already providing more than that, but there were several, apparently, that were limiting their youngest students to a meager 15 minutes, but even so, it's actually disheartening to this play-based educator to learn that a half hour is considered a victory. The ostensible reason for such pathetically restricted recess is that longer recesses cut into that all-important "classroom time," but I also heard from some quarters that some administrators favor limited or non-existant recesses because the longer children freely play, the more likely it is that they will wind up in conflicts. Let me be the first to say, "Duh." 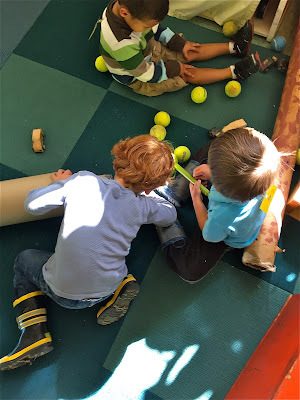 As a teacher in a school that engages in no direct instruction, but rather bases its curriculum on the evidence of how children learn best, which is through their own self-selected free play, I'm here to tell you that conflict stands at the center of how learning happens. Our entire school day, is, for all intents and purposes, recess, and yes, much of what the children are doing while playing both indoors and out is bicker. For adults interested in eliminating bickering, I would say that 15 minutes is about right: it usually takes the children at least that long just to figure out what they're going to do, which, in a robust classroom like ours, with lots of kids with lots of agendas engaging with shared and limited resources, is typically followed by a period of often intense negotiation, which often shows up as conflict. 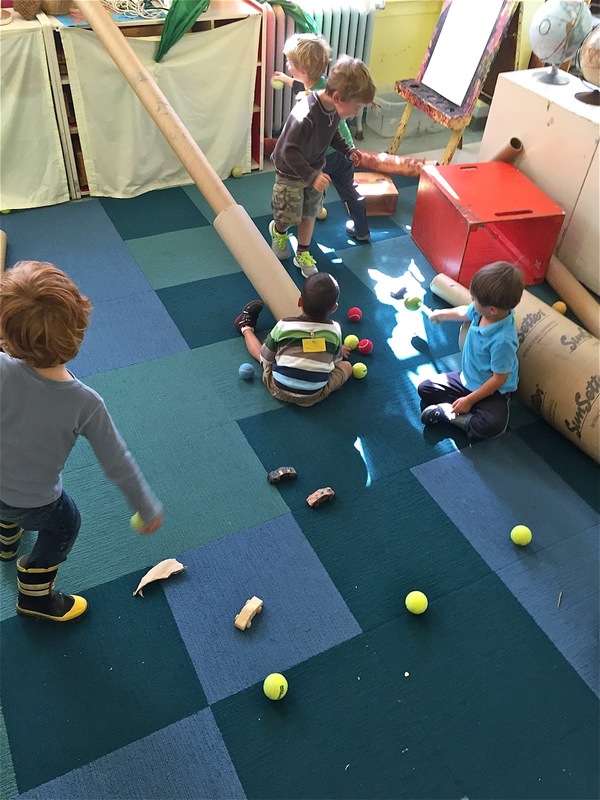 Yesterday, for instance, a group of four and five-year-olds, mostly boys, found themselves playing together with a collection of cardboard tubes and tennis balls. For the first 15 minutes or so, they engaged like independent agents, each arranging tubes, and collecting balls for their own personal use. That time passed relatively quietly, with each of them exploring and experimenting. The next 15 minutes was characterized by physical and emotional chaos, as they began to bump up against limitations of space and resources, but the real impetus for the conflicts were their divergent ideas for how they were going to play. Most of the kids were setting their tubes up at angles down which they were rolling balls, but at least one guy was more interested in using the tubes as a way to practice balance, rolling them the way a lumberjack might. The resulting spills and his lurching body, of course, tended to upend his classmates' carefully constructed efforts and there were a lot of things said about it, like, "Hey! You're knocking over my tube!" which was followed by a round or two of argument, sometimes even accompanied by shoving and other physical attempts to solve their impasse. Others began to collect balls, "all the balls," which lead to complaints like, "Hey! You have all the balls!" Some objected when friends would block up the end of the tube so their balls couldn't pass through, robbing them of the satisfaction of witnessing the end result of their experiment. By the end of this 15 minutes, there was one boy crying, several flush with frustration, and a couple who found themselves wound up into a slightly hysterical state by the hubbub. This is where I did my work for the day. I stepped in several times to help cool tempers and encourage conversation, which I did by reminding the children of the rules they had made together the previous week, the agreements we had made about how we wanted to treat one another. Among those rules were such classics as "No taking things from other people," "No hitting," "No pushing," and "No knocking down other people's buildings," along with an agreement that if someone tells you to "Stop!" you must stop and listen to what the other person has to say. Most of the conflicts I let run their course as the kids were talking, sometimes loudly, sometimes heatedly. As long as they were heading toward resolution I stayed on the sidelines, but when things became physical or the emotions turned intense, I dropped to my knees in the midst of it and said things like, "I saw you take that tube from him. We all agreed, 'No taking things from other people,'" and "He's crying because he worked really hard building that and you knocked it down." But mostly what I did, was encourage the children to listen to one another by simply saying things like, "I want you to listen to what he has to say." This is the period of recess play that those administrators want to avoid. I know that many schools consider recess to be a time for the classroom teachers to catch a little break, leaving the school yard in the hands of a few "monitors." One kindergarten teacher told me that they often have 40 or more children per adult on their playground. I know I wouldn't want to face that second 15 minutes without all hands on deck. So why do we put up with that second 15 minutes? To get to the third 15 minutes. That's when all that bickering begins to pay off. That's when all the conflict and talking and listening start to bring all those ideas and agendas together. For the next half hour, I more or less sat on a bench and watched the children play, together, saying sentences to one another that began with the invitation word, "Let's . 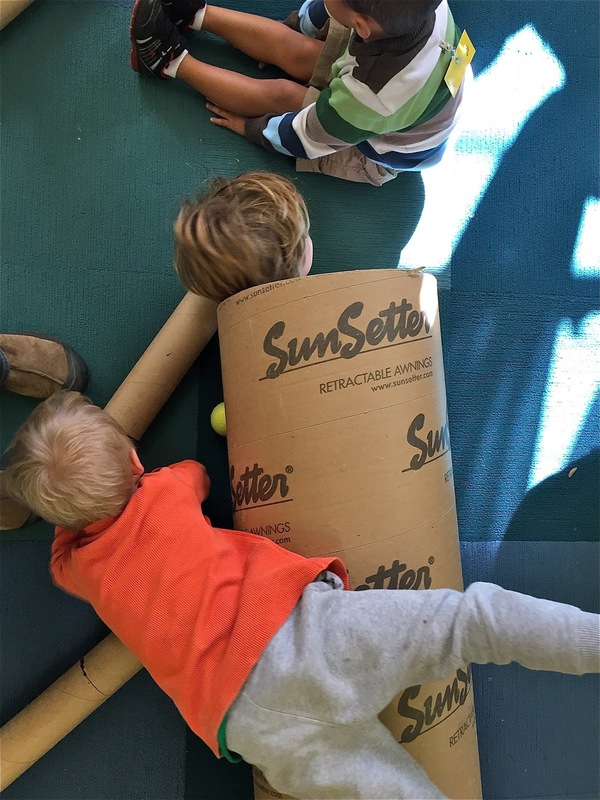 . ."
"Let's connect all the big tubes!" "Let's put all the balls in this bucket!" "Let's move it over here!" 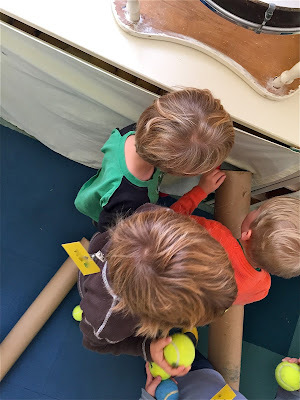 There was still a bit of bickering, but it was of the productive variety, with children actually listening to their friends' thoughts and ideas, sometimes disagreeing, but mostly finding ways to incorporate it within their own agenda. 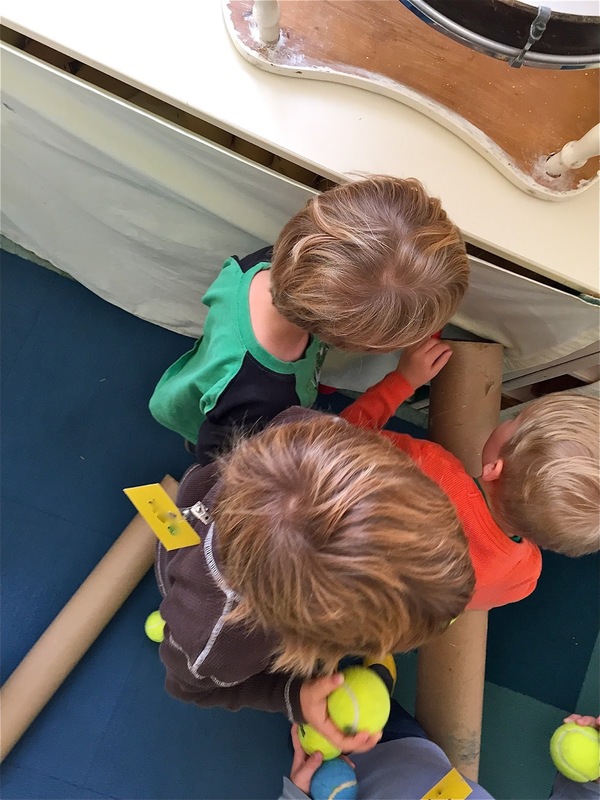 This is the gold standard of a play-based curriculum: creative, cooperative play, and the only way to get there is through that second 15 minutes.